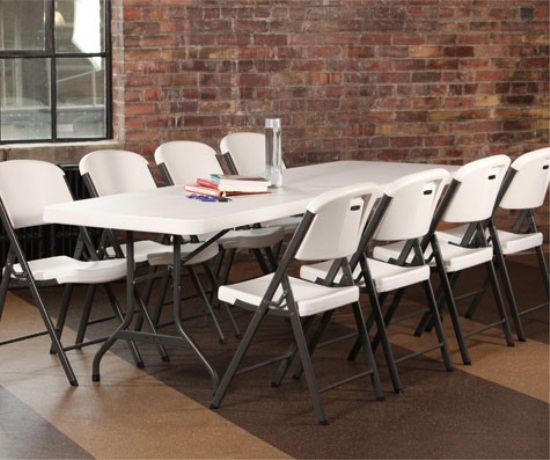 Product: Lifetime Tables - 42984 Almond Color 8 Ft. Folding Tables - Banquet Style Design. 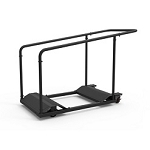 The 42984 package saves you money per table and on shipping costs than ordering 4 single lifetime tables. Lifetime 8 ft Folding Table with a 96" x 30" Almond Molded Regular Eight Foot Top, 1-1/8" Round Bronze Hammer Tone Folding Frame, Indoor Outdoor Use. Great for church and school use. Commonly used for wedding banquets and rental companies for large gatherings. These tables are commercial grade and come with a 30 day money back guarantee if you are not completely satisfied. Take advantage of our winter sale by saving over $50. Sale good while supplies last. 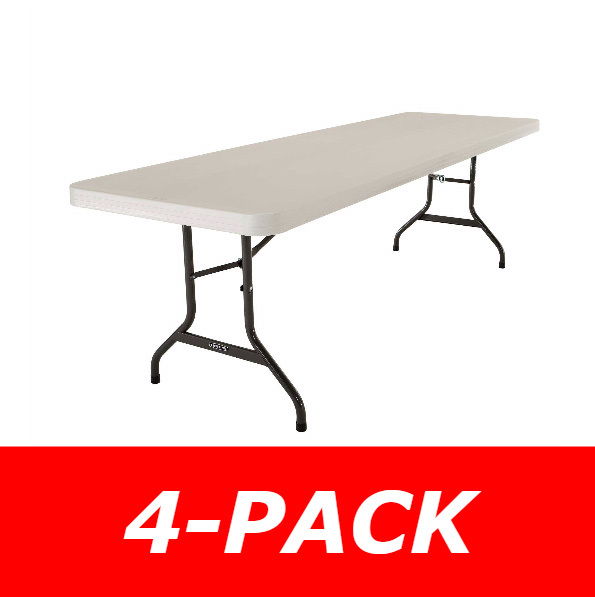 42984 4-Pack Lifetime tables meet ANSI/BIFMA Standards and has a weight capacity of 1,900 lbs. These 42984 4-Pack Almond tables are too large to ship via UPS or FedEx. They ship on a motor freight carrier such as Roadway. The carrier calls to schedule a delivery appointment as signature is required. Please note that residential deliveries or locations without a loading dock may require assistance in unloading the tables one by one. If you only need one table please view model 22984 . Competitive Edge Products, Inc. is an authorized Lifetime distributor. 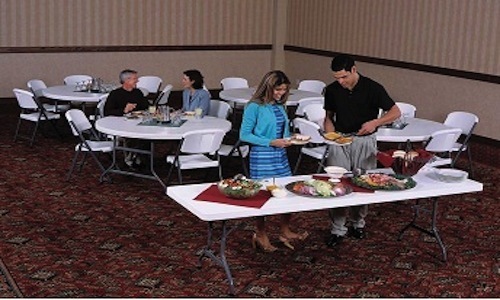 Please also see our other Plastic Tables, Portable folding table, and Folding Card Tables. 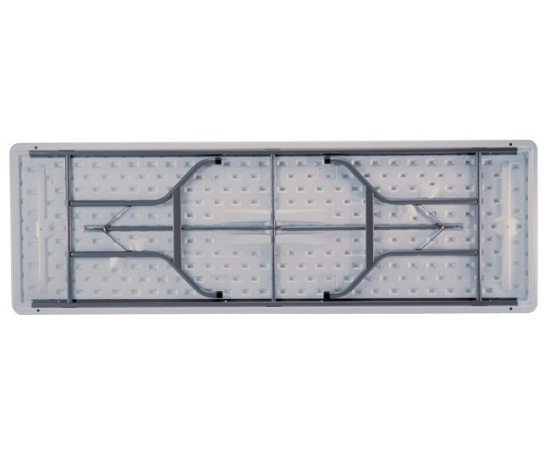 We have several other packaging and color options for the 8-foot plastic table products. 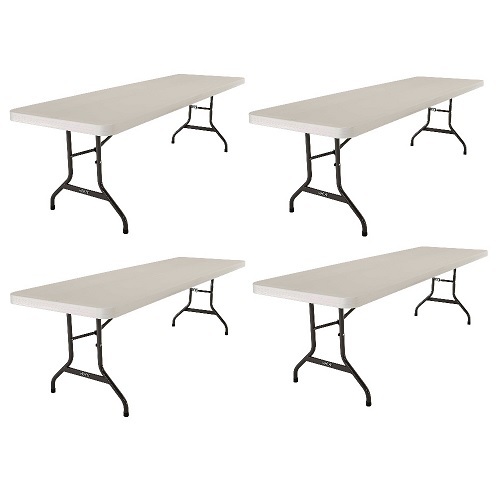 Ordered tables for our conference room. Delivery was fast although one came in damaged. They replaced it with no problems and we received it the next week. Now that is great service. The 8 Lifetime tables we purchased are for our church. They are strong but light weight and easy to move. I highly recommend them for church functions. I shopped as always and found the best price here. The tables are the best, strong but light. Very happy. Making my garage sales easy and professional looking. Our local bingo hall uses your tables and they had some extra ones and we bought one for our personal use. We use it at family gatherings for card and game playing and to put food on for buffet style dinners. They are light weight and easy to move and clean up great. Thanks for an excellent product. We were given one of these tables as a gift. When we used it for a family dinner we decided to get a couple more so we could seat everyone. These tables are amazing they stow well, they clean well and very sturdy well made product we will continue to buy from lifetime! We have several of these tables we use for our business and at home. 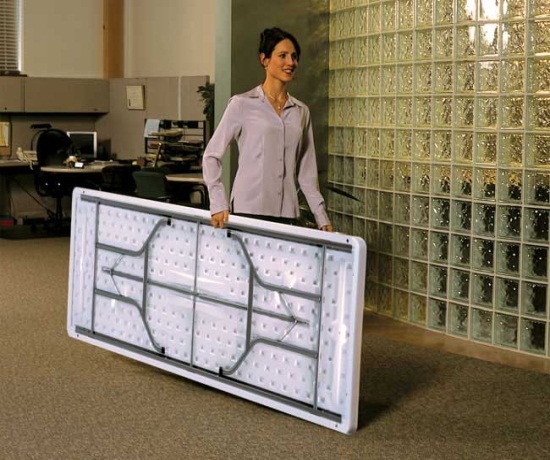 They are so sturdy and light and are easy to transport. Love Lifetime products! Q: Do they fold in half? A: These tables do not, but the 80175 tables do fold in half. Q: What is the weight of an individual table? A: They weigh about 45 pounds. Q: Are these the new stackable tables or the regular ones? A: These are the older style. The newer design that stacks is model 80299. Feel free to contact us with any other questions. Q: Do you have White table? A: Yes, the model number for the white table is 42980. Shipping: Orders for the 42984 Almond 8' Tables generally leave the warehouse within 1-3 business days. Shipping Varies Greatly by location - call for estimates - but should be less than 10 days for farther transit. Dimensions: 96" x 30" x 15"